Congress will be in recess May 12th-16th and this is the perfect opportunity to make an appointment to speak directly with your U.S. Representative to request support for The National Nurse Act of 2013 as a co sponsor. Personal contact from a constituent is the most effective way of advocating for a cause. Visit the Take Action page on the National Nurse website for helpful tips and a website to find out the locations of your U.S. Representative’s district offices. 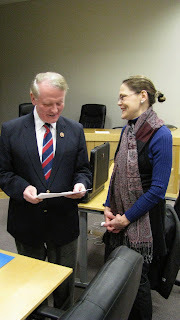 In early February 2013, Audrey Bayer, RN, BSN, of Lambertville, N.J., learned that her Congressional representative, Leonard Lance (R-N.J.), would be holding mobile office hours near her home. Although she says she is not “a political person,” Audrey Bayer, RN, BSN, of Lambertville, N.J., contacted the National Nursing Network Organization and decided to bring the National Nurse Act (H.R. 485) to the attention of Congressman Leonard Lance (R-NJ). The NNNO has talking points and informational materials that can be easily downloaded from your home computer. Please contact the NNNO Board once your appointment has been scheduled. We are here to help!